Are you struggling with acne that just won’t go away no matter what you do? Do you get jealous when you see people with clear skin? Do you feel a deep anxiety when you look into the mirror? Is acne the only thing in your way preventing you from being truly happy and enjoying life? How would you feel if you could get up in the morning knowing that you don’t have to worry about your skin? Life is already full of things that you need to worry about. Why should your skin be one of them? Isn’t that just unfair? How would your life be if you have skin so clear that you could walk out of the house with confidence. No more worrying if people are going to stare at your acne. Or worse still dreading the moment some random stranger makes a comment about your acne. What if you could look forward to shopping for great makeup just to enhance your looks and not to hide your acne? Or you could even skip the makeup completely. Wouldn’t it be great to just have that choice? Imagine you’re late to work. A touch of lipstick and some eyeliner is all you would need. Now, let’s get something straight. I know why you’re here. Acne has taken over your life and it seems to be getting worse with each passing day. You just can’t take it any more. There is no break from it. On some days it seems to be the only constant in your life. You’re always on the lookout for the next latest cure, never mind that you’re still trying the last cure you spent your money on. Isn’t it just annoying when someone you know has perfect skin no matter they do, while you struggle everyday with your skin? Not fair at all!!! Does this seem like a dream to you? It probably does. Now how do we turn this dream into a reality for you. “The Acne Healing Diet” is your ticket to clear skin. The guide to feeling free in your skin. No more feeling anxious before going out of the house. No more wondering if someone is going to make comments and give you advice about your acne. Is this something you want to say no to? Now let me explain a little more about “The Acne Healing Diet”. This is my first ever e-book where I give you all the knowledge I have gained over 6 years regarding diet and acne. I have not held anything back. All my tips and tricks are all in the book. I will explain how diet causes acne as well as fixes it. I explain why conventional cures don’t really work for adult acne. I give you simple and easy to follow diet tips that do not require you to starve or go into social hibernation. While I know that food causes acne I also know that food is a major part of our personal and social lives. Do crazy things – The internet is filled with weird acne cures. Trust me, I know. I have researched everything while trying to cure my acne and while developing my site. From rubbing banana peels on your face to coffee enemas – yes you read that right (I’m not drunk) – to other things I really can’t even mention because it would gross us both out. Buy 35672 supplements all costing big bucks – Most cures I have read about require you to buy supplements that they claim can help cure your acne. While I admit that when you have acne you could be lacking certain nutrients, you don’t need to buy every supplement under the sun. The way most acne diet books work is to cut out most foods and take very possible supplement. Forgive yourself for having acne – Don’t even get me started on this one. I could go on and on about it. Forgiving yourself for something means you were responsible for creating the problem. No one, in their right minds would do something if they knew for a fact that it gave them acne. Would you? No way. No crazy diets – The problem I have with most books on diet is that they tell you that all foods out there are bad for you. You should eat only organic foods that have been blessed by the angels and that fairies and elves have danced on. While I do admit that food today is much more processed and manipulated than food 50-100 years back, there is nothing you can do about it. Well, that’s not really true. It would be if you went off the grid and grew your own vegetables and fruits and became an excellent hunter. Do you want to live a hippie lifestyle? If you do great. No problem at all with that. If not, you can’t possibly live happily off such diets. The writers of such books assume that you would be as thrilled as they are and cut out everything possible from your diet. While these woo-woo diets may work for a short while, they are never a long term strategy. The world has changed, diets have changed and we have to accept that. Telling you to live a 19th century life while you live in the 21st doesn’t really help you now, does it? Also another thing people who write these books forget, is that diets are different all over the world. Paleo diets may be well and good for someone who lives in America or Europe. But for a person from India, China or Japan such a thing may not even be possible. Diet is not a one size fits all solution at all. I have made sure my book does not assume that. In the past 2 years 100’s of people have benefited from my diet tips. My inbox is filled with emails telling me how my tips have worked. And hand on heart I have never asked these lovely people to completely change their diet. This includes people (mostly women but there have been some men too) from all over the world and of different ethnicities. Now it’s your turn. You’ve probably spent boat loads of money on dermatologists, skin care, medications, supplements. And you have not been cured. That’s why you’re here. How much more do you want to spend? Are you going to spent more money on acne cures out there while not getting the results you want? Skin clinics, dermatologists and skin care treatments an easily cost you more than $750 per year, without giving you the skin you want!! How much more are you going to spend? And you’re never sure if you’re going to see results. Also you have to keep spending more and more money to buy products. And all “The Acne Healing Diet” will cost you is $48. For 80 cents a day for 2 months only ( 60 days ) you could have clear, acne free and beautiful skin. It is not a lot to pay for clear skin for the rest of your life. And the best part is you won’t have to spend another dime ever on acne. How do I know this diet based approach will work? Here is one thing I know with absolute surety. In the crowded and noisy world of acne cures diet is the only thing that actually works. It is exactly what helped me get rid of acne and get clear skin. Not just with acne, but throughout my life I have found diet to be the cause of many of our health problems. The problem is I always believed medical professionals who told me that diet had nothing to do with any of my skin issues. Don’t be the fool I was. I know you’re smarter than that. Why can’t I just take Accutane? Of course you could. And if you really want to, you should. But as someone who has been there and almost taken the drug, please do your research before taking it though. I don’t want anything bad to happen to you in your quest for clear skin – something we all should have without struggling for it. But you know what? There’s no guarantee your acne will heal even with Accutane. If it does, there is no guarantee your acne won’t come back. I have emails in my inbox of stories of 2 rounds of Accutane and the acne came right back. Just google and check. See the 100’s of stories told by people who have taken Accutane and have not got rid of their acne. And in addition to still having acne they also have side effects like permanent hair loss, dry skin, frequent nose bleeds. You can then decide if Accutane is worth it or not. How much will I have to change my diet? That depends entirely on how fast you want to see changes in your skin. The more change you want to see, the more changes you’re going to have to make. The changes are not difficult at all and are all easy to implement. Start slow and small and you’ll soon be on the way to having clearer and better looking skin. “The Acne Healing Diet” gives you week by week instructions on changing your diet. Will I get a hard copy of “The Acne Healing Diet”? 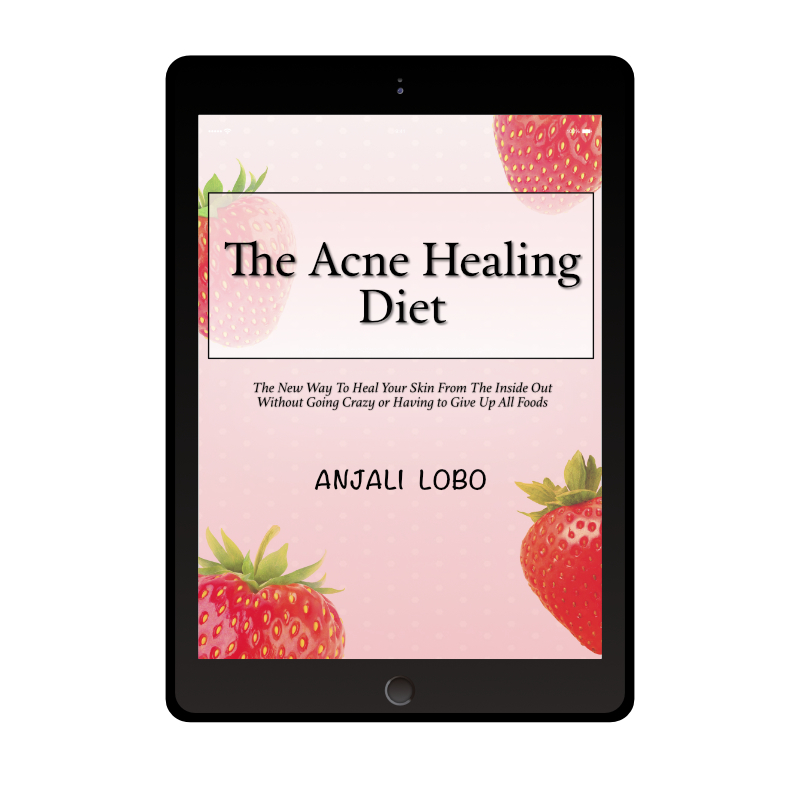 “The Acne Healing Diet” is an e-book and there are no hard copies. You will only get a soft copy. Why can’t I buy another book about acne? You could and definitely should if you want to. There are a lot of books on acne out there. And I have bought a lot of them. Here are the main issues I had with them. The diet is too restrictive. No normal human being can survive on them. The diet is catered to people living in a certain part of the world only. Diets around the world are very different. I have kept that in mind while writing my book so that you can use it wherever in the world you live. They assume that one diet approach works for everyone. While acne may be caused for some people by food, the food in question differs from person to person. While for some other people acne is caused by a deficiency in the diet. So there you go. I’ve laid it all out for you. What are you waiting for? Get instant access to “The Acne Healing Diet” and watch as your life changes during the next few weeks.